What a year! And a gluttonous one it was. It has been a pivotal year for the Washington, D.C. food scene, and I feel lucky to be living in the nation's capital as we are undergoing a culinary transformation. I want to take this time to reflect on some of my favorite meals and food experiences throughout the year. Thanks for helping to make it a great one. My favorite new restaurant openings in Washington this year include Red Hen, Ghibellina, Doi Moi, Le Diplomate, The Arsenal at Bluejacket, Casa Luca, and Etto. 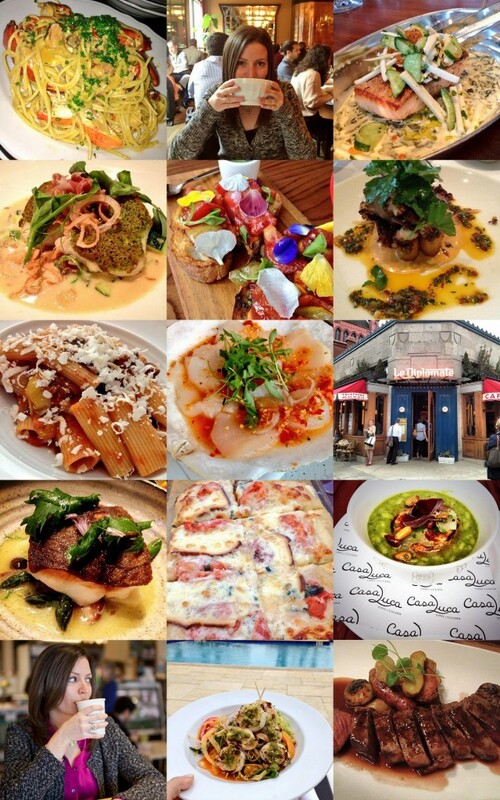 What a great year for new food in the District. I took a trip to Austin, Texas for SXSW and fell in love with the amazing food and restaurant scene. During that week I ate at so many great spots including: La Condesa, Lamberts Barbecue, Perla's, Second Bar and Kitchen, and more. It's a great city, and I cannot wait to return. You can read more about my food adventures in Austin here. I was so excited to celebrate my TV debut in March. I filmed a segment called Street Eats: USA with the Travel Channel in the summer of 2012, and the special finally aired early this year. I got to host a segment about the D.C. food truck scene, and it was a blast. You can see the TV segment here. Hopefully the first of many great opportunities in the future. In April I took a trip out to San Francisco, and then made my way to Portland, Oregon and the Willamette Valley for a long weekend. I always enjoy the great food in California, and on this trip I hit up Flour + Water, Frances, and The Slanted Door. I was wowed by Oregon, and could not believe how great the meals were at Tasty n Sons, Park Kitchen, and Pok Pok. Also, if you're heading out to Oregon wine country, do not miss Adelsheim Vineyard and the Red Hills Market in Dundee, OR. Full rundown on the Oregon trip here. Two of the best meals I had in 2013: the lobster spaghetti at Joe Beef in Montreal, and the roasted goat at Komi here in town. Both stand out as special and memorable. More about my weekend trip to Montreal can be found here. Everyone who lives in the Washington area appreciates a good trip out the Maryland and Delaware beaches. I took a week long trip with some close friends and we ate our way through Lewes, DE and Rehoboth Beach. Next summer when you are heading to the shore, be sure to check out these great dining locations here. Some of our favorites included A Touch of Italy, The Cultured Pearl, Half Full, and Agave. Everyone is always looking for the perfect date spot in town. In September I highlighted some of my favorite places that make for a romantic and intimate meal. Maple and Cork are just two of my picks. In September I took a very unique and amazing trip to Reykjavik, Iceland. I hiked a glacier, relaxed in the Blue Lagoon, and also ate at some very sophisticated and upscale restaurants. On the high end, my favorite was Fish Market, and on the low end, I loved the casual vibe and delicious pancakes at The Laundromat Cafe. More about my meals in Iceland here. The best food event in 2013 was Chefs for Equality which brought together top chefs and mixologists around town to support equality and the Human Rights Campaign. I had a great time trying so many delicious bites from Sebastien Archambault of Blue Duck Tavern, Kyle Bailey of Birch and Barley, and Todd Gray of Equinox to name a few. Thanks to Capitol File Magazine for featuring me in their 2013 summer issue as I discussed artisanal edibles, and for allowing me to write the Cui-Scene piece for their holiday issue. I picked some of my favorite restaurants in town for a non-traditional holiday meal such as the dim sum brunch at The Source, and I also highlighted some of my favorite specialty shops including Righteous Cheese. I am off to Italy on December 27th to celebrate the new year, and my 30th birthday. I have no doubt I will indulge and have some incredible food experiences. Thanks for continuing to follow along with my food adventures, and I look forward to having a great 2014. Wishing you a happy and delicious year!